A marionette costume is a great way to reuse an old costume as it requires no sewing. Any character can be made into a marionette. For example, if you have a king costume you can be a king marionette or if you have a bear costume you can be a bear marionette. 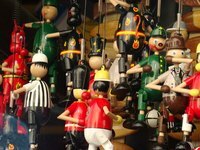 The most traditional marionette would be a child wearing a traditional European folk costume: a girl could wear a short dress, apron and pigtails, while a boy could wear shorts, an open collar shirt and suspenders made of embroidered ribbon. Drill holes 1 inch from each end and in the center of each yardstick. The diameter of the holes should be slightly larger than the diameter of your string. Knot the end of a 24-inch-long piece of cord and run it through the center holes on both yardsticks. Tie another knot on the other side of the yardsticks to hold them together. Cut four 30-inch pieces of cord and thread one through each of the remaining four holes. Tie a knots at both ends of these cords. This is your marionette crossbar. Add round, rosy cheeks to your face using the rouge, and then make freckles with the eyeliner. Create hinges and pins on your elbows and knees by drawing a curve around the top of each joint and a large dot on each side of those joints. Attach the knotted ends of the longer puppet strings to your elbows and knees using round bandages. Attach the center string to your back with a safety pin or to the top of your head with a hair clip. Carry the crossbar around with you or have someone taller than you hold it up over your head. For a quick costume, you can attach the strings to the yard sticks with masking or duct tape. Paint the yardsticks a solid color before you begin. You could glue the yardsticks together at a right angle to each other for a more realistic appearance, but it will be easier to handle if you don't. If you are going to be very active, tie the strings to your joints rather than using bandages. Or if you are wearing trousers and long sleeves, sew or pin the strings onto them. Add a yellow felt hat with a red feather, suspenders, a blue bow tie and a long prosthetic nose for a "Pinocchio" look. Children should always be supervised when using power tools.